Cable stitches pull the knitted fabric together. They type of cable stitch used will determine how drastic this effect is. When cables are worked above Stockinette or Garter stitch (other patterned stitches as well but we’ll use Garter stitch as an example here to keep things simple), the cabled portion of the fabric ends up narrower than the Garter stitch section, causing the Garter stitch section to pucker. 38 sts are cast on, 4 rows are knit (Garter stitch) and then the cable pattern is worked over the centre portion (the cable pattern shown between the red lines in the chart above is worked twice for this sample). As you can see in the picture above, the cable stitches pull the fabric together causing the Garter stitch rows at the bottom of the piece buckle – this effect – the need for the ‘plain’ portion of the fabric needing to spread out in order to lie flat again – is called Cable Splay. This effect happens both below and above a cabled section unless measures are taken to avoid this. The Garter stitch portion of the swatch above has too many stitches to lie flat so, in order to have the Garter section not buckle once we knit the cables, we need to either 1) cast on fewer stitches to let the Garter stitch section lie flat and keep our cabled portion as it is or 2) add additional sts to the cabled portion. How many stitches depends on the type of cable that will follow. For the cable in the sample, I have chosen Option 1. I have removed 2 sts at the base of every 2/2 cable in the chart, so a total of 8 sts (since there are 2 cables in the chart and the sts within the red lines are worked twice giving me four 2/2 cables). Only 30 sts are cast on (the grey squares in the chart are ‘no stitch’ placeholders). On Row 4, stitches are increased under each of the 2/2 cables (in this case a lifted kfb – knit front, back – is used). The fabric lies perfectly flat! 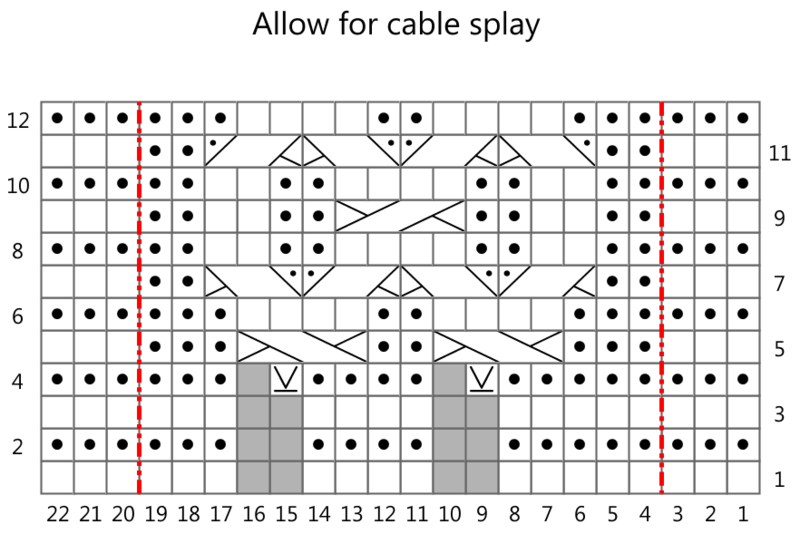 As mentioned above, how many stitches are added to avoid cable splay depends on the type of cable that will follow. Some complicated cables create massive pull across the fabric and will need more stitches added while other cables create hardly any pull at all. And then there’s the type of yarn you are using which will affect the outcome as well. So does it all come down to trial and error and swatching? Yes indeed! But the good news is that you do get better at estimating what’s required the more you work with cabled designs. I like to use anti-cable-splay increases to make the ribbing flow into the cable pattern.